"The thick plastic is nonporous and odor-resistant." "The butcher block quality wood won’t easily suffer scratches." "These sturdy boards are known to stand the test of time." "Composite boards give you the best of both worlds"
"A flexible board is a smart option for everyday use"
"These no-frills cutting boards do the job at a budget-friendly price." "This traditional carving board is designed specifically for carving roasts." This is the other board that you should have in your kitchen tool collection. 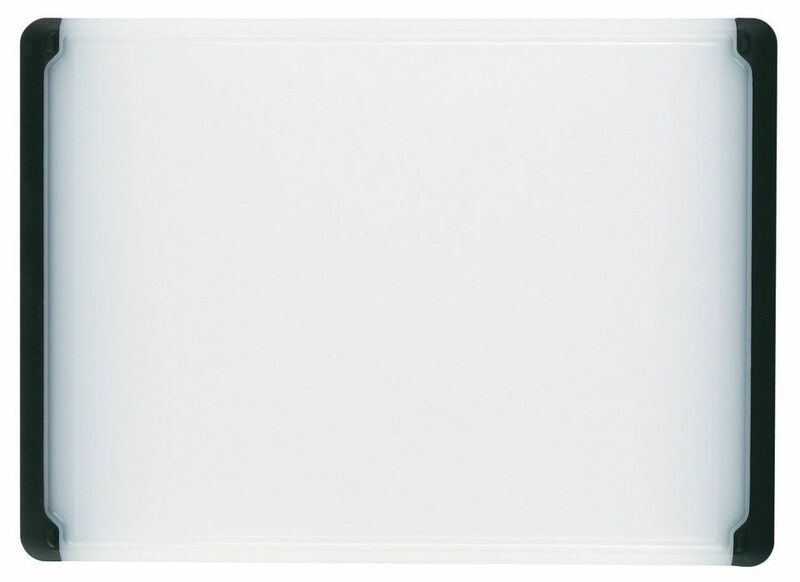 The 10.5- by 14.5-inch plastic board from OXO is a true workhorse. It is just the right size—a bit larger than a piece of letter size paper—so it's ideal for most chopping tasks. The soft, tapered handles on two edges make it easy to grip and carry from your counter to the stove, and because it can go in the dishwasher it’s ideal for cutting up raw meat and fish. The groove around the edge of the board, while it cuts down on the chopping surface, does prevent tomato juices, or worse yet, those from raw meat, from draining onto your countertop. A word of warning, that this board does stain, but that’s mostly an aesthetic issue, and won’t affect the quality of the board. Cleaning it in the dishwasher will also make it show wear and tear more clearly, so stick to hand-washing when possible. By far the most aesthetically pleasing, and traditional option, a wood cutting board is a kitchen staple. They might have lost out in popularity recently with the rise of bamboo and plastic alternatives, but a 100 percent wood board is a kitchen must-have. This wood cutting board is made of maple hardwood, and comes in a range of five different sizes. The largest 20- by 15-inch board can handle everything from carving a pork roast to chopping all the veggies from your farmers’ market haul. Wood boards like this one are also incredibly durable, and this one has two sides that can be put to use since neither have raised feet. The butcher block quality wood won’t easily suffer scratches, scoring, or dents from your slicing and dicing. 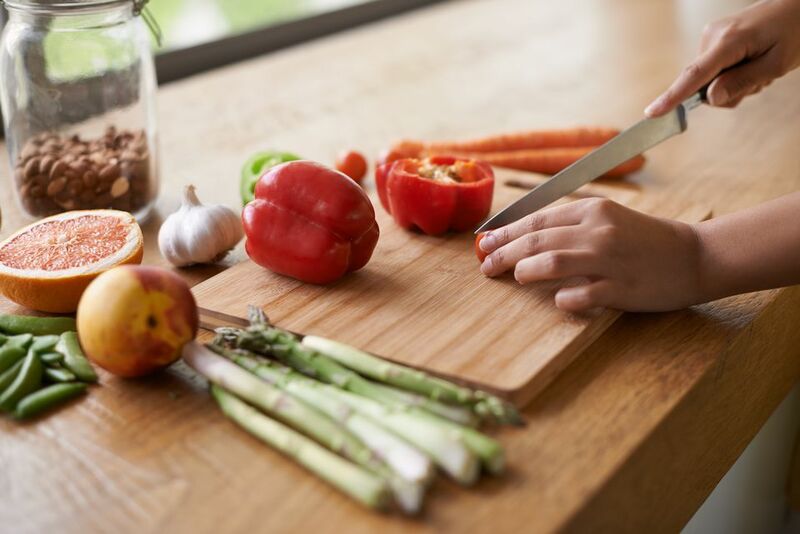 Keep in mind that you will need to give a wooden board a bit more TLC to keep it in top shape, but caring for your chopping block is easy. The only complaint about this product has been with the packaging. Some reviewers report that their shipment hasn’t come with the proper plastic wrapping. The best thing about this Amazon top seller is that the boards in this set are surprisingly tough. Bamboo might not seem like a tough material, but it is one of the best at camouflaging the wear and tear it endures from all your knife work. The three boards in this set are conveniently sized, with the largest measuring 9.5 by 13 inches, the medium, 9.5 by 11 inches, and the small one 6 by 8 inches. The non-porous surface of these boards mean they won’t absorb any juices from your raw beef or chicken, and will resist staining from tomatoes, beets, carrots, and more. The smooth surface also prevents your knives from dulling too quickly—a definite bonus. The two larger boards have cutouts to create handles or make them easy to hang on a hook on the wall. Hand-washing is the best option to extend the longevity of these boards, and it’s recommended that you use the revitalizing oil as well. According to consumers, these sturdy boards are known to stand the test of time for many years, keeping replacement costs low. That is, of course, as long as you take proper care of them. It’s also possible that you don’t want a board that’s plastic or wood. In that case, consider opting for composite boards, which gives you the best of both worlds. This composite set gives you three cutting boards in a range of sizes to cover all of your food prep needs. The large board measures 10 by 17 inches, the medium, 14.5 by 9.5 inches, and the smallest comes in at 10 by 7 inches. These boards are designed to withstand all the possible chopping, mincing, dicing, and slicing tasks you’ll encounter in your kitchen. Plus, they are even heat safe up to 350 degrees Fahrenheit, so you can use them as a trivet in a pinch, or carve a turkey straight from the roasting pan. Like the plastic OXO board, these from Epicurean are dishwasher safe, and will actually show less wear and tear than the plastic ones. And if you’re not a fan of the faux wood look, they also come in a slate color. One of the few disadvantages is that these boards don’t have a channel around the edge to keep liquids from running off the board. While it’s not a deal breaker, it does mean you’ll have to clean more spills off your counter. When you're not doing heavy-duty chopping, a flexible board is a smart option for everyday use that can be used on slicing simple things like bananas, cheese and more. This set comes with three colored mats and it's BPA-free. The fact that it is dishwasher safe is a plus for most because you can clean it safely, though it does have an anti-microbial coating. What's best about a folding board is when you are done chopping you can fold up the board and scrape food into your pot or bowl so you don't miss. Plus, they are easy to store. While we don't recommend for chopping everything (think hard onions and root vegetables) on them they are a good option to have for daily use. These no-frills white cutting boards do the job at a budget-friendly price. The set includes three boards in different sizes, so you always have the one you need, whether you’re cutting a tomato for a sandwich or chopping cabbage for a slaw. The polypropylene surface is non-porous while being gentle to knives. Each board has a handle and a full-surround cavity that contains juices. The set includes one 7" x 7"board, one 8.5" x 11" board, and one 11" x 16" board. They are dishwasher safe for easy cleaning. You can certainly use a standard cutting board for carving a roast, but they’re not made for that purpose. This traditional edge-grain maple carving board is designed specifically for carving roasts or poultry. This board is available with or without short spikes that hold the meat securely, yet they don’t pierce the meat so deeply that they interfere with slicing. The deep grooves routed into the board are ideal for catching juices before they spill onto your counter. The juices can then be collected for a sauce or gravy. The boards are finished on all sides. The spikeless board is reversible. These boards are made in the USA. They should be hand washed. Our reviewers spent 10 hours testing a top-rated cutting board. They used it nightly for weeks on end, cutting different types of food and cleaning up. We asked our testers to consider the most important features when using this cutting board, from its material to its size. We've outlined the key points here so that you, too, know what to look for when shopping. Material Cutting boards are made from a variety of materials including wood, bamboo, man-made composites, and plastic. While plastic can usually be cleaned in the dishwasher, wooden boards are naturally antibacterial, so hand washing is sufficient. Looks aren’t critical when you’re using a board just for cutting, but if you plan to serve cheese or appetizers on yours, look for one that fits your personal style. Size From tiny to large, cutting boards come in an array of sizes. In general, bigger is better, but large boards can be hard to wash and store — and if you’ve got a small counter, you don’t want the board to be hanging over the edge. Small boards aren’t as useful for meal prep, but they come in handy when you’re slicing a tomato for a sandwich. Grooved vs. flat Some cutting boards have a groove around the edge, while others are completely flat. A groove is great for containing meat juices, but it’s also handy when you’re cutting other juicy foods like tomatoes. Flat boards are perfect for dry foods like carrots and cabbages.